With his equipment set up on an impossibly low table, renowned multi-media artist Herman Kolgen came across like a mad scientist, hunched over and enthralled in his work. The work itself involved harnessing the power of earthquakes to make a truly unique audio-visual experience. At the beginning of the show a message appeared stating that via an internet feed, real-time seismic disturbances would affect the performance in unknown ways, basically saying that he was going to be collaborating with earthquakes for the evening. The audience was then brought around the globe via satellite images to areas where earthquakes were currently taking place. First on the list was Alaska, followed by Honduras, then Indonesia and Japan. As you might imagine, this process led to a wall of sonic rumbles and distorted high pitch tones. Musically, the experience was grating, closely resembling someone with poor coordination attempting to plug a guitar lead into an amplifier. 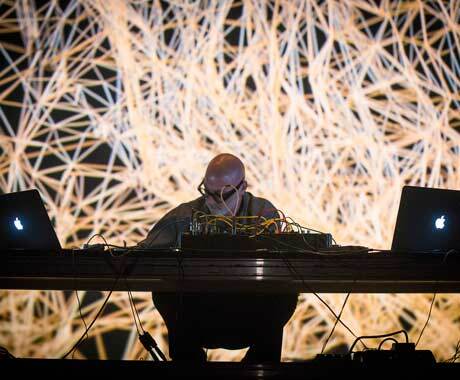 Conceptually, however, the performance was mind-blowing; Kolgen tapped into area of audio-visual performance that no one else has even considered before. Despite the harsh sounds emanating from the Imperial stage, Kolgen remained thoroughly engrossing throughout as he smiled and bobbed to the sounds of the substrata.